Ben Tomlin has lived in Toronto and been an only child for all of his 13 years of life. But one day, his father decides to uproot the family and move across the country so he can conduct an experiment on chimpanzees and language acquisition. This, however, is not just any ordinary animal experiment. Dr. Tomlin wants to bring the chimpanzee home and raise him as if he were a human child. At first Ben is resentful, but he soon starts to bond with Zan and eventually views this chimpanzee as a little brother. Both Ben and his mother treat Zan just like a member of the family, but his father sees him as nothing but an experimental test subject and discourages Ben and his wife from getting emotionally involved. 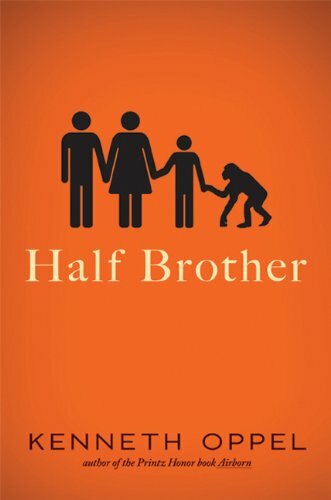 Half Brother is by far Kenneth Oppel's most important book to date. He brings to the reader's consciousness, many questions about animal experimentation and what constitutes cruelty. However, just as a true author should, he doesn't give us any answers or preach his point of view. The purpose of the book is to get you to think and to spark discussion. Just when you think one point of view is right, there is a twist in the story that gets you to consider another way of thinking. This would be an excellent book to read with a class full of high school students and then get a debate going about what is cruel and what isn't. I want to thank Kenneth Oppel for writing about this topic. It gets people talking about it and brings it into young people's consciousness. I would love to see it taught in high schools. I am on a quest to get more contemporary books in classrooms while only teaching a small percentage of classics. It's books like this that will help fuel my fight to teach modern, relevant books rather than those dusty classics that kids can't relate to. This was by far one of the best reads of 2010. I'm so glad you reviewed this. I've been interested in it, but haven't seen anyone talk about it. Definitely makes me want to grab it. I love this book partly because I know sign language and deaf people. It is definitely one of the best books I own and it's even better that it takes place in Canada where I am from.